PC students attend classes on a 4x4 block schedule. Four 90-minute classes are offered per term, mimicking the university experience. Students complete eight courses in a year, thereby allowing room for additional electives throughout their PC experience. Differentiated learning options abound. 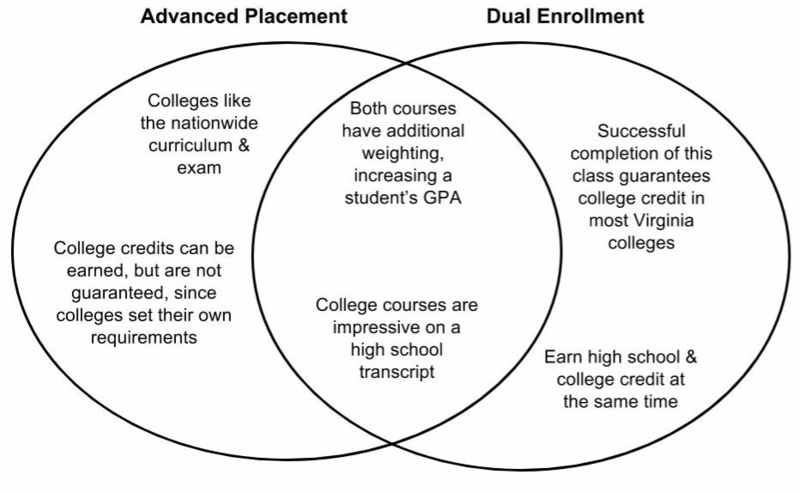 Students may choose to take classes with integrated honors to challenge themselves; qualified students may enroll in Dual Enrollment or Advanced Placement college-level classes. Through a partnership with Thomas Nelson Community College (TNCC) and Richard Bland College of William & Mary (RBC), qualified students can take a number of Dual Enrollment (DE) courses which follow a college level curriculum, taught by approved instructors. At the end of the course students receive college credits which can be transferred to their future college. Advanced Placement Courses are approved through the College Board and students must take a national exam at the end of the course. Students who pass the exam (3 or above) may be granted college credit through their chosen college. Grades are measured on a 10-point scale. Additional weight is given to honors (+.5) and AP/DE class grades (+1.0). PC does not rank students by grade point average. AP vs. DE... What's the difference?